Justin Hewitt claims the second Youth Ranking title of the season! Christian Tosso claims his first ranking title with victory at the Carmelo Ellul Trophy! In what was a truly amazing evening of darts, Christian Tosso put on a display worthy of a professional, showing the skill that he had previously demonstrated in last year’s World Masters. 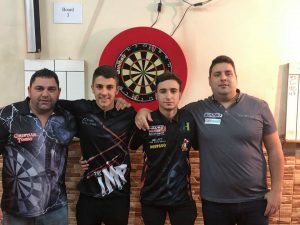 The turnout of 35 players at the College Cosmos Club, featured the very best of Gibraltar’s elite, and it was those top players that the unseeded Christian had to beat on his way to winning the title. In the first round he overcame the old master, Francis Taylor 4-2, then 4th seed David Francis 4-3. This was followed up with a very high scoring game against 5th seed Justin Broton, resulting in a tight 5-4 win. The semi-final against Dyson Parody, Gibraltar’s undisputed no.1 player, looked like going Dyson’s way when Christian missed a couple of early doubles, but he held on strongly, taking out the deciding leg on 76. This then put Christian in the final up against rising star Justin Hewitt. Justin hadn’t had an easy draw by any means, facing George Ramos in the preliminary round, winning 4-1. He then successfully defeated 6th seed Sean Negrette 4-3 and Carlos Munoz 4-0, before beating 3rd seed Antony Lopez 5-3 in the quarter finals. In the semi-final it was another tense game, this time against 7th seed and team mate Craig Galliano, who he narrowly defeated 5-4. The final itself, between Christian and Justin was exciting to watch, with both players trading high scores, but loose darts and missed doubles caused frustration to creep into Justin’s game, and the ever constant Christian Tosso calmly took the final 6-2. Congratulations to Christian Tosso, commiserations to Justin Hewitt! The statistics speak for themselves, with a total of thirty one 180’s and five ton plus finishes, as well as a substantial number of games finished with 15 or fewer darts. Ranking Standings after three events played.